Cliff Thornton was reminded of the Longstone lighthouse on Farne Islands, while Charles Payton suggested Phare de Gatteville at Gatteville le Phare, France, built in 1835 to replace a tower on the site of 1734, and 75 meters tall, with a base reminiscent of the painting. Andrew Greg commented that Gatteville looks very convincing and produces two versions of a painting showing the lighthouse by Jean-Louis Petit, identical to Museum Sheffield’s. The artist exhibited one at Le Salon des Artistes Français de 1839, as ‘Phare de Gatteville, près Barfleur, suites d’un gros temps’. Pieter van der Merwe applauded the discovery and wondered about the Bingham collection. He gave Petit’s dates as 1795–1876, exhibiting at the Salon 1812–1832, showing landscapes and historical scenes, plus painted canvases of Cherbourg, Granville, ports in Jersey and of Paris. 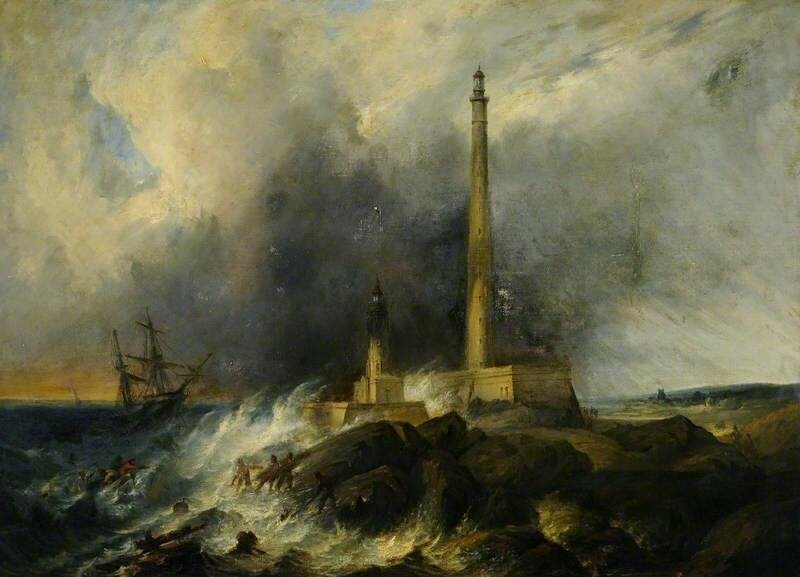 Pieter suggests signing off the painting as ‘The Lighthouse at Gatteville, near Barfleur, after a Storm’ by Jean-Louis Petit. Andrew Greg suggested ‘attributed to’ or ‘after’. It is a version of his painting in the Musée Thomas-Henry, Cherbourg, probably exhibited in 1839 at Le Salon des Artistes Français de 1839, as ‘Phare de Gatteville, près Barfleur, suites d’un gros temps’.